Probably the most modern villas in Marbella - visit the showhouse. New project near Villa Padierna!! Located beachside San Pedro Playa within easy walking distance of the beach. Quiet, prestigious villa neighbourhood, 9 minutes from Banus. Dominant sea views. Atalaya golf & schools. Beautiful home in a quiet spot, directly on the golf, great privacy, 200m from the beach. 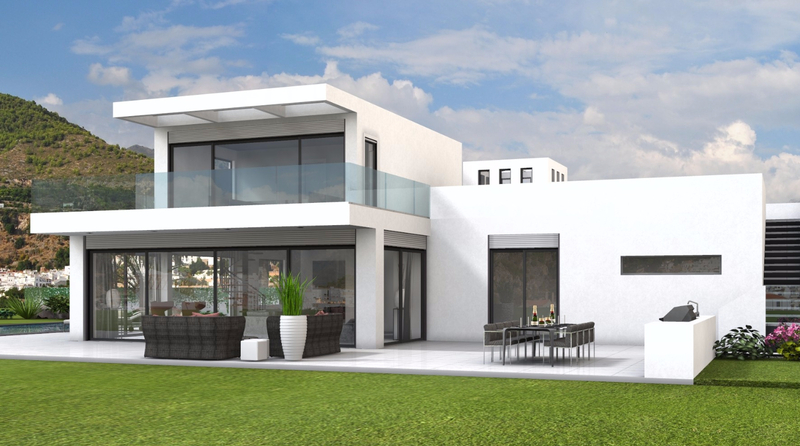 Note - a second, similar home is under construction 100m from the beach in Guadalmina. Only a 10-minute drive from Puerto Banús. Substantial Luxury villa in Los Flamingos Golf - superb views - private listing - P.O.A. Beautiful new build villa, ready to move in, excellent layout and location plus impeccably finished. €4.450.000. Quiet, prestigious villa neighbourhood, 9 minutes from Puerto Banus. Dominant sea views. Near Atalaya golf. Three levels stacked in a spectacular way; with views over Atalaya Golf Fairways and the sea. 8 minutes from Banus and surrounded by Atalaya, Marbella Club, Los Arqueros and El Paraiso Golf. High tech construction ready in 12 months. DHM34117 - Ultra modern & cool villa - new Golden Mile - P.O.A. 34910 - New build contemporary villas from €985000 - PLOT INCLUDED! Built to the highest standards and just 200m of the beach. This community was created just behind the Atalaya Golf Course, hidden on the left side of the road to Benahavis. Located just three minutes from the highway and the San Pedro tunnel, La Alqueria is located less than ten minutes from Puerto Banus, and close to the international schools of San Pedro. Plus - a new international college is under development at walking distance near the Benahavis road (as well as a Mercadona supermarket). Located at altitudes of around 100m above sea level, the area boasts beautiful golf and sea views. Golfers will find they are only five minutes from the Atalaya Golf, El Paraiso Golf, Marbella Club Golf and Los Arqueros Golf; while Los Flamingos, La Quinta and Los Naranjos are only ten minutes away. Hidden behind the apartment complexes of Benatalaya, La Alqueria (and it's more exclusive sister area, Condes de Luque) consists mainly of recent villas with a tendency towards more contemporary designer villas. The easy access to San Pedro with its beautiful promenade and more authentic Spanish feel (plus a number of quality beach restaurants and beach clubs like Bora Bora) is also a plus; as it means one can also 'let one's hair down' and relax outside of the hustle of Marbella and Banus. The brand new tunnel under San Pedro now means that one gets by car to Puerto Banus in just 10 minutes; promising exceptional value gains for this area west of Marbella. Not surprisingly, all major insiders, hotels & developers are investing heavily on this side. Just behind La Alqueria, developers are working on the Marbella Club Resort project which will consolidate this 'Golden Hills' area extending from La Zagaleta to Los Flamingos. Please note that there are at least three distinct areas which are commonly called 'Alqueria' but vary in character and price level. The first (easternmost) area, Condes de Luque, obviously offers the best access and views over the Atalaya Golf cours; and is an area with generally more expensive villas although plot prices are relatively good value. Next is the original and gated 'La Alqueria Villas" development; also with golf views; and even further west there is a third area with slightly more difficult access and little or no golf views; translating into slightly lower prices.